Ram Mounts new holder for the CF-U1 is everything you’d expect from RAM; an amazing design, simple to use, and as rugged as the Panasonic CF-U1 Toughbook itself. The laptop docking station features DB9, VGA out, RF-45, 5 USB ports, dual RF pass thru, DC input, and cable tie slots. The vehicle laptop holder has a 1.5 inch rubber ball "c" size for mounting adjustments. 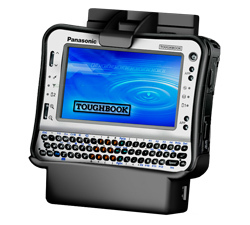 You can be sure your RAM Mounts powered docking station is as durable and as rugged at your Panasonic CF-U1.